Can You See It? . . .
Busyness distracts us from the things we should be seeing. I’m living proof of this reality. Everything that should be foreground becomes background, and it isn’t noticed, pondered, or enjoyed. Yesterday I stopped for a moment to correct that error. I was on one of my regular routes for an afternoon ride. My bicycle takes me to some places here in Lancaster County that are stunning, especially at this time of year. 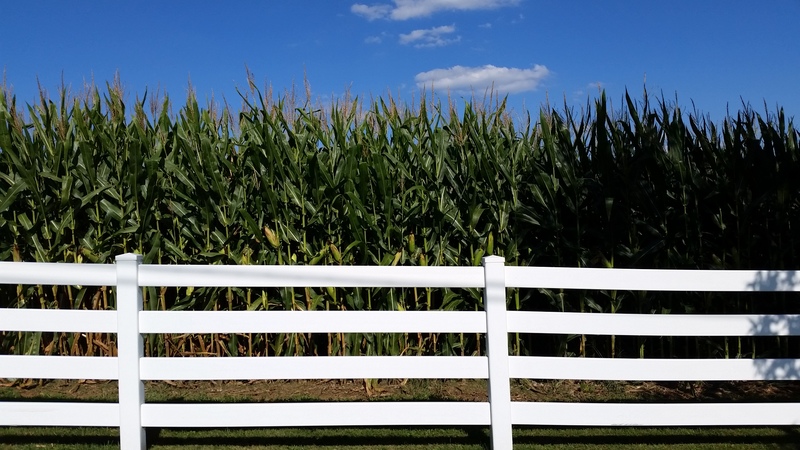 There’s a short stretch of fence bordering a corn field that consistently beckons a quick look left simply because the contrast always catches my eye. I finally doubled-back to catch this picture. . .
As I rode on, I thought about how our urgency to press on and get things done keeps us from seeing what we should see. As I pondered this familiar scene, I couldn’t help but think about what it reveals about God’s glory. There’s blue sky, green corn, and white fence. The sky, as it always does, declares the Glory of God. Every glance upward should remind us of His providence. The corn reminds us of the Creation mandate. . . to be fruitful and multiply. . . to till, cultivate, and steward the earth that He has entrusted to us. And, as we do, we rely on Him to grow that which we’ve planted. Finally, the fence speaks loudly to the image of God in humankind. Sure, the vinyl fence was manufactured in a factory somewhere. But humans took raw materials given to them by God and used their God-given minds to develop formulas and processes to create vinyl fence. . . a process that images our Creator. Somehow, this scene and countless others like it capture theological realities that scream solo deo gloria!! Still, it’s all so easy to miss. ← Life Is Short. . . Have An Affair: Duggar, Fogle, And The Rest Of Us. . .
And I see a bit of shade creeping in. I thank God for the sun on my face, but also the refuge of shade.